The general advice for washing roofs of all descriptions is to use a Soft Wash, not a high pressured power wash. A soft wash can be carried out using your normal pressure washer. You just need to keep it on a low pressure (eg 500 psi - 1,000 max) and use the wider fan spray all the time that you're washing and rinsing the roof. For dirt and debris that just won't be removed at that lower pressure, there are other "soft" ways to loosen it up and clean it off. A broom or garden blower can help clear the debris. Using the right detergent for your particular roof situation will then deal with the residue. Particularly stubborn dirt spots might even be sponged, mopped or brush-scrubbed individually, if necessary. Colorbond or similar product roofs need a gentle approach to prevent patching or scratching or other damage to any of the coating. Mild detergents are recommended, with some people even using dish detergent. Sponging or mopping can be used on stubborn stains. All detergent should be rinsed off at the end. Harsh chemicals that could contain paint thinners, kero or turps, for example, should not be used. They can damage the surface. Terracotta tiles can look mouldy if not cleaned regularly. Moss, mildew and lichens tend to thrive on them. The solution is to spray the roof with an anti-fungal detergent and leave it on for a few days. When the green sheen on the roof turns brown, the moss etc is ready to be washed off. It will now usually wash off fairly easily. As well, terracotta tiles can withstand a higher water pressure, eg around 2,000 psi. However, as the tiles age they can become more fragile. If you tread in the wrong place they break. So, for older terracotta tiles it may be wiser to call in the professionals. If it's a DIY, watch out for any tiles that may have been shifted, chipped or cracked. These will need to be repaired at some stage. Cement tiles are safer to walk on than terracotta. There is less risk of breakage as long as you avoid those lines along the roof where the tiles overlap each other. As with terracotta, they can attract mossy growths. The treatment is basically the same: spray with an anti-fungal, anti-moss spray and leave for a few days. Then you'll be able to pressure wash it off fairly easily. Take care as the first spray will have left the tiles slippery. Use a spray fan wash and keep the nozzle about half a metre from the cement to avoid any etching or similar damage. Slate tiles are long lasting and they don't usually require cleaning very often. Over time though, they can attract moss. Although durable, they are also brittle, and are not made for walking on at all. As well, a high pressure spray can easily damage them. 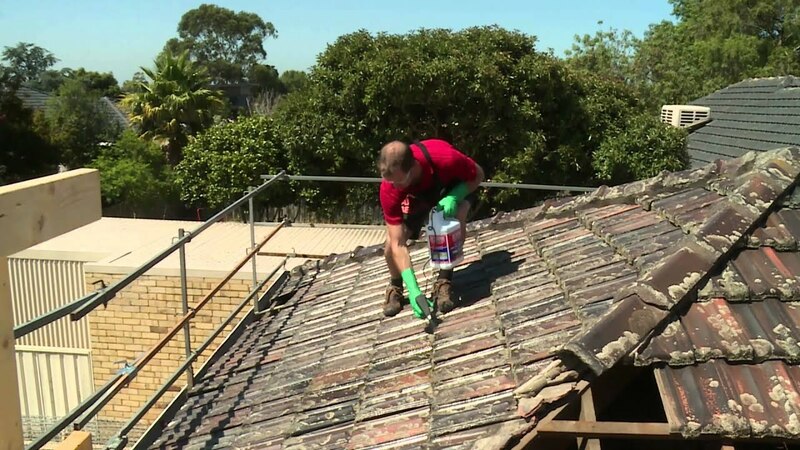 If your slate roof needs cleaning, it is probably best to contact professionals, in particular those who have experience in cleaning slate tiles.